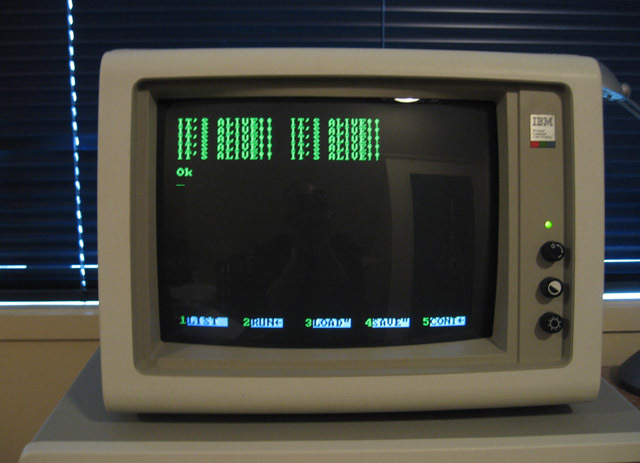 The IMB 5150 (the original IBM-PC) is one of the jewels in my collection. However, lately the monitor had become flaky and then had completely failed. The symptom was no (apparent) power, as indicated by a completely back screen and no power-on light! As prior to complete failure I'd often been able to restore normal operations by whacking the right side of the monitor, my suspicion fell on a dry solder joint, perhaps in the power supply? Last Thursday night I finally bit the bullet and decided to see if I could repair it. The first task was to open up the monitor. The screws on the bottom were obvious enough but surely there were also screws on the top? But where? Nothing was visible. Perhaps the thing just pops apart? After much tugging and cursing I decided to check an email I received a few weeks ago about how to open these things. Ahh..the screws are under the two plastic tabs at the top. I see...cunningly disguised. Anyway, I popped these tabs, removed the screws and in no time at all had everything naked. I soon identified the power supply. That was the vertical metal unit on the right side of the monitor (when facing the screen) with all the stickers over it saying "Danger, high voltages, 400V etc.!"!! Taking this apart was fiddley but not difficult. The circuit board was vertical, which would have put stress on things like the transformer pins. It was also on the side of the monitor where I used to slap when power failed. My dry solder theory strengthened. I checked the board again..this time with a multimeter. I also looked very carefully at all the components, not just the solder joints. Ah ha! 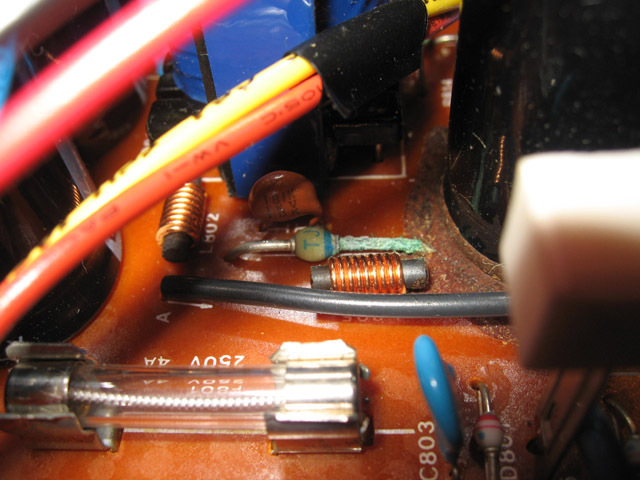 Looking closely deep among the components I saw a corroded-looking diode as shown above. Checking across this with a multimeter from the base solder points showed no connectivity at all. I touched the corroded pin with a screw driver, and it simply fell off the diode. I felt I'd found the answer. However, what type was it? Removing the diode, checking the code on the case and looking up on Google for an equivalent type revealed nothing? I posted my problem on the Vintage Computer Forum and the guys got back to me with advice as to what I could use to replace it. I took this advice, got hold of the recommended diode, soldered it up, reassembled and volia! Working! Hooray! Another successful repair. Lessons learned, (1) Don't jump to conclusions, (2) Check out all suspected components visually and with a multimeter before diving in with the soldering iron, (3) friends on forums can be very helpful, (4) don't be afraid to give things a go, even if it is on your most expensive classic computer. If it's not going, what have you got to lose?